Representation Agreements let you decide in advance who can make health decisions for you in the event you can’t make them yourself. The golden years offer very different opportunities then they have in the past. Many Boomers live long lives and are very active. And while the spirit may still feel young, the body, unfortunately, doesn’t always get the memo. As people grow older, the chances of having accidents or suffering serious health issues grow significantly. According to a report by the Canadian Medical Association, nearly three-quarters of Canadians over 65 have at least one chronic health condition. The report also states that 62% of hospitalizations for Boomers are due to unexpected falls. As you get older you need to be ready for the very real possibility that something could happen. A situation may arise leaving you incapacitated and unable to make health decisions for yourself. A Representation Agreement is a legal document that allows a person (or a group of people) to make personal care and health decisions for someone else. This allows someone you trust to manage your affairs if you are incapacitated and unable to make your own decisions due to illness, injury, or disability. Without a Representation Agreement, a doctor or healthcare provider will choose your Temporary Substitute Decision Maker (TSDM) if you can’t make your own decisions. This person is selected based on the Health Care Consent Act. Your spouse would be the first choice, followed by one of your children. Your TSDM is required by law to make decisions based on your best interests. However, this person may not necessarily be the person you want, or may not know what type of care or treatment you would prefer. A Representation Agreement allows you to choose in advance who you want to represent you. The only people who can’t be appointed as representatives are paid caregivers. 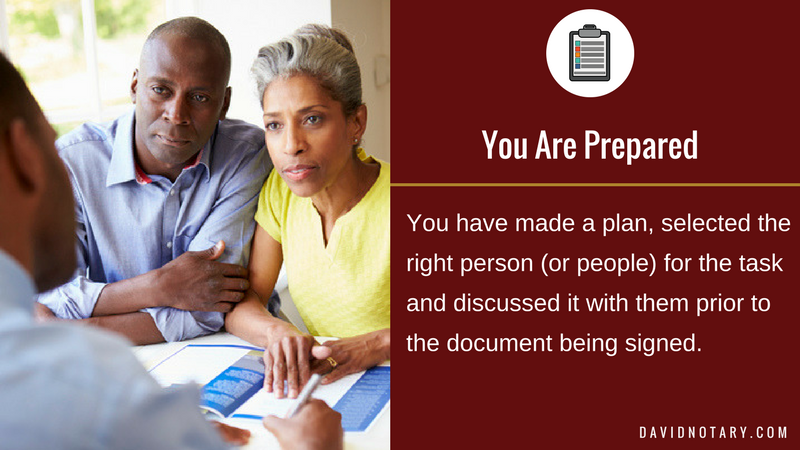 Most people chose a spouse, partner, friend or family member in their representation agreement. 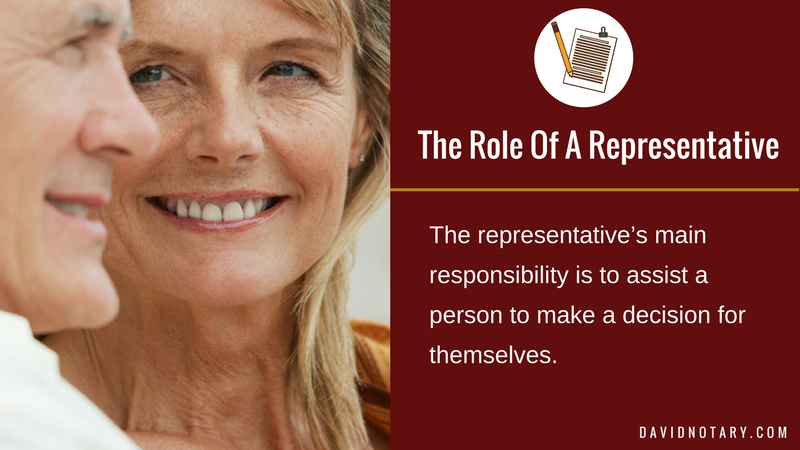 The representative’s main responsibility is to assist a person to make a decision for themselves. This means that before making any decision, the representative is legally obligated to try to determine your current wishes. 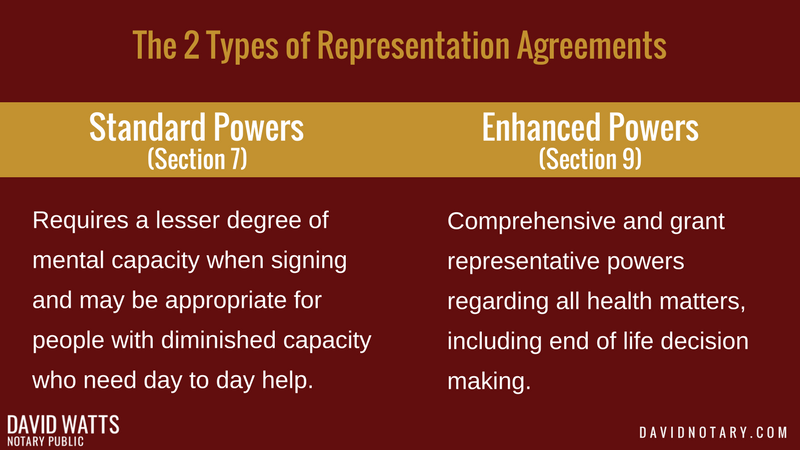 If you are completely incapacitated and your current wishes cannot be determined, then your representative will follow what has been outlined in your Representation Agreement. As a last resort, the representative will make a decision based on what they think is in your best interest while consistent with your values. Without a Representation Agreement, your TSDM is unable to make any of these decisions on your behalf. Their power is limited to immediate minor and major healthcare decisions such as surgeries and routine treatments. 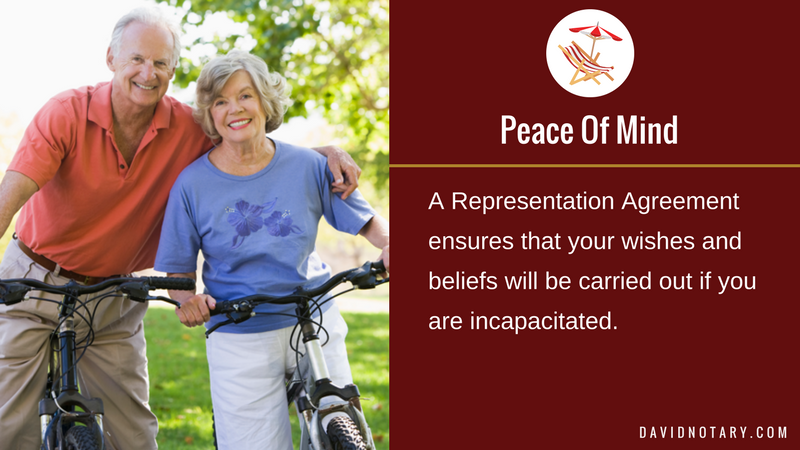 With a Representation Agreement, you have the peace of mind that your wishes and beliefs will be carried out if you are incapacitated. When someone you love experiences a serious health issue it’s stressful, and depending on the severity, often heartbreaking. The last thing anyone needs is additional stress during this time. The benefit in organizing a Representation Agreement in advance is that you have made a plan, selected the right person (or people) for the task and discussed it with them prior to the document being signed. 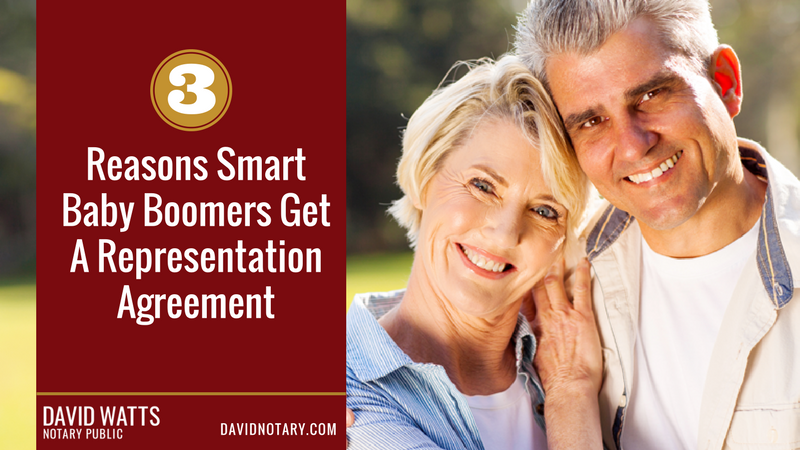 In the unfortunate event that something does happen that requires the Representation Agreement to take effect, your loved ones are adequately prepared. A Section 7 Representation Agreement allows a chosen representative to take control over minor and major health care, personal care, legal affairs and routine financial affairs. Someone can sign this type of Representation Agreement even if they cannot manage their own affairs or make decisions independently, which is why it’s purposefully limited. It does not hand over responsibility for larger decisions regarding finance and end of life options. A Section 7 Agreement requires a lesser degree of mental capacity when signing and may be appropriate for people with diminished capacity who need day to day help. Section 9 Representation Agreements are much broader in scope and are signed before there is any question regarding a person’s mental capability or competency. These agreements are comprehensive and grant representative powers regarding all health matters, including end of life decision making. The important things to consider in moving forward are who you would want to name as your decision maker(s). You may name an alternate should the person you choose be unable to act when called upon. 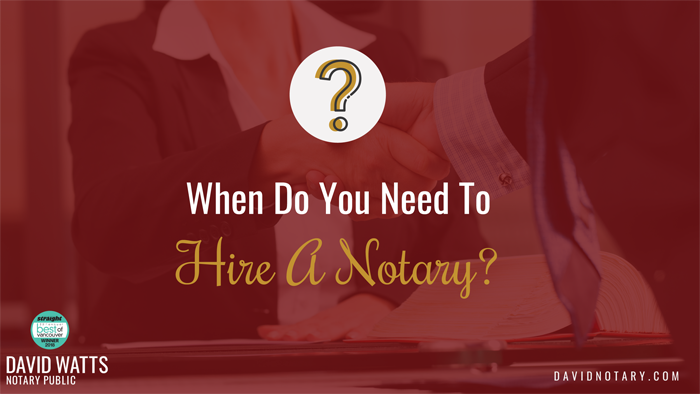 Your Notary can help guide you, discuss the process and answer questions when we meet. To find out more including information about our process and receiving a quote for us to provide this service; please call or email us. 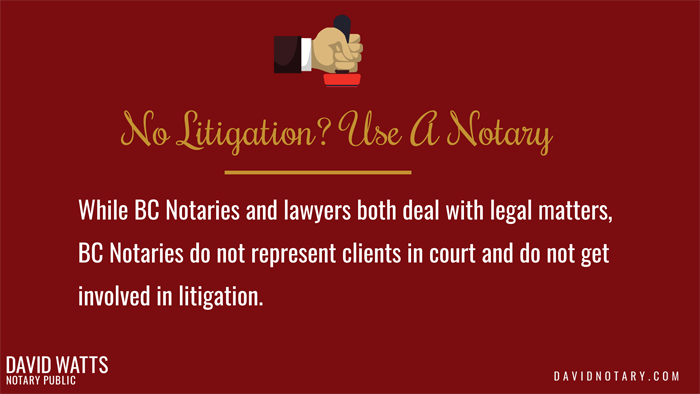 We are happy to assist you directly or to provide a referral for a notary or lawyer in your area. David Watts, Notary Public discusses his process for preparing Wills.